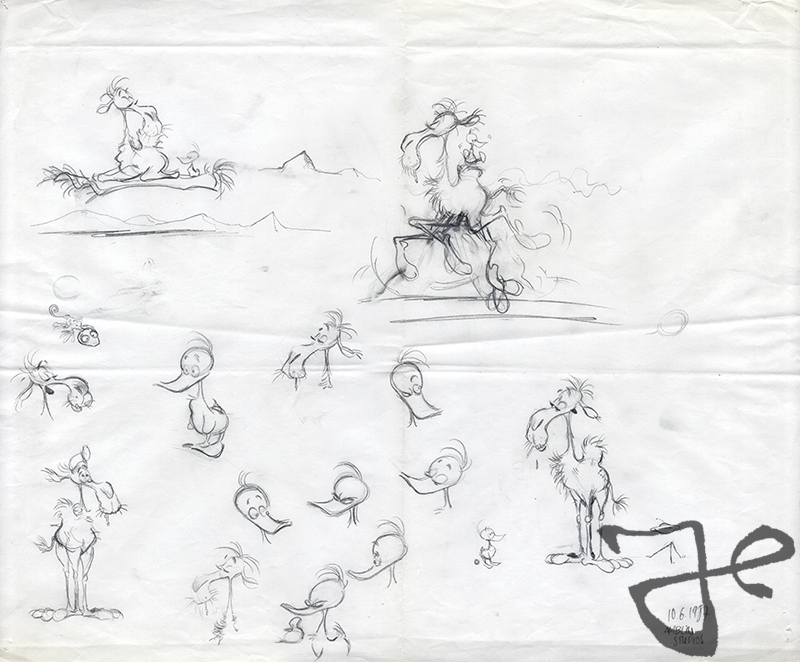 In the spring of 1987 Harald Siepermann and Hans Bacher worked in London on character design of the weasels for Who Framed Roger Rabbit. 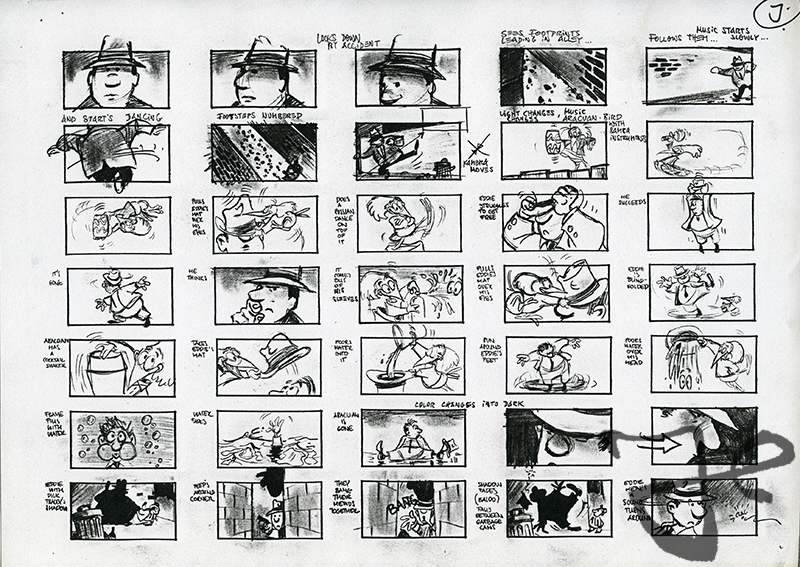 When their work was finished, Animation Director Richard Williams asked if they wanted to go to Los Angeles and work on the storyboard for the ‘Escape from Toontown’ sequence. 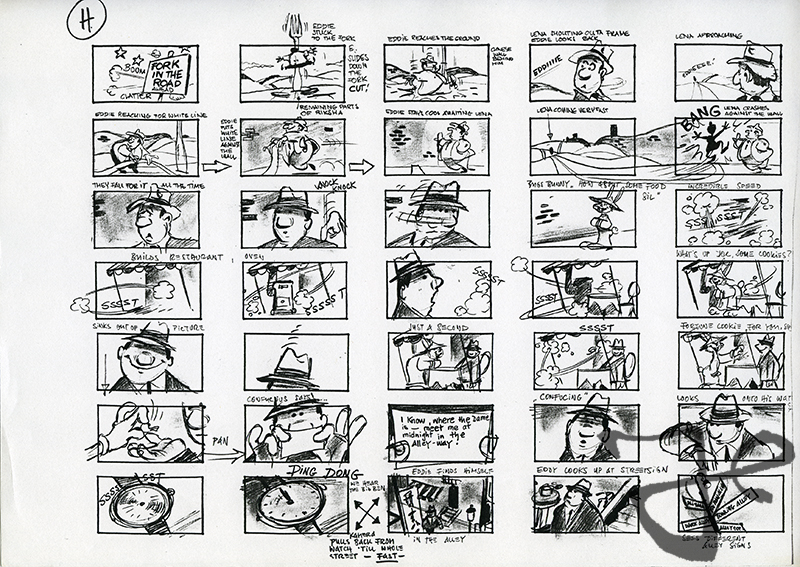 In this sequence Eddie Valiant, played by actor Bob Hoskins, finds himself in a cartoon world. In June, Siepermann and Bacher flew to Los Angeles and worked for several weeks at the Amblin Studio, that was located at the Universal Studio lot. 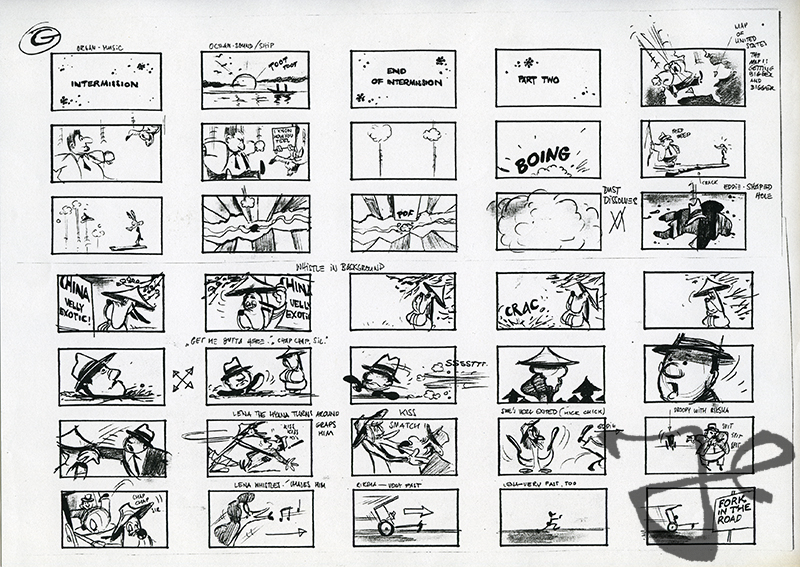 Nobody had worked on this sequence yet, therefore Siepermann and Bacher had to start from scratch. 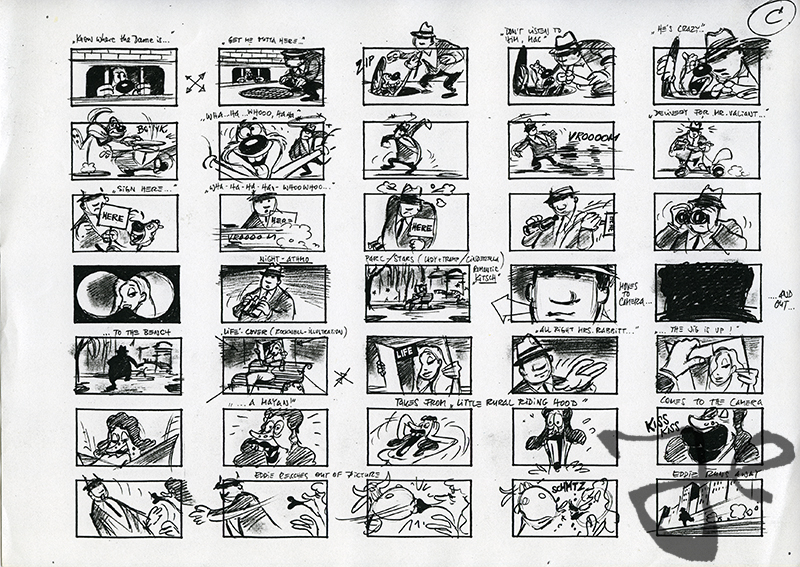 Director Robert Zemeckis gave them the task to draw and write down everything they could think of and to include a lot of Tex Avery jokes. 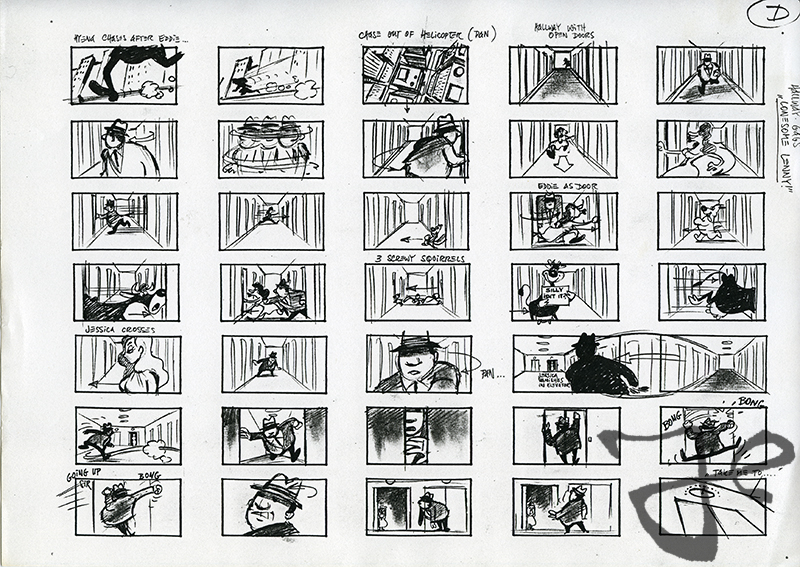 Siepermann and Bacher drew the funniest storyboard that run up to 15 minutes. 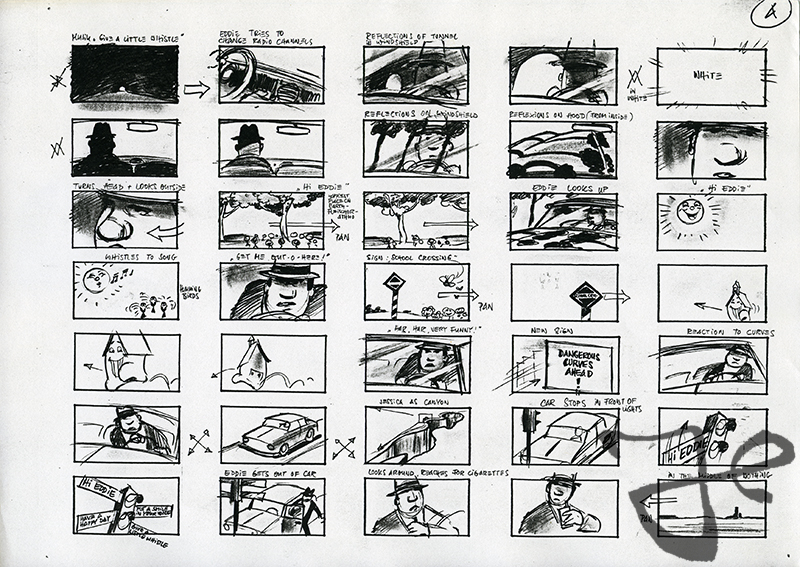 Eventually only 45 seconds was used in the final version of the film. 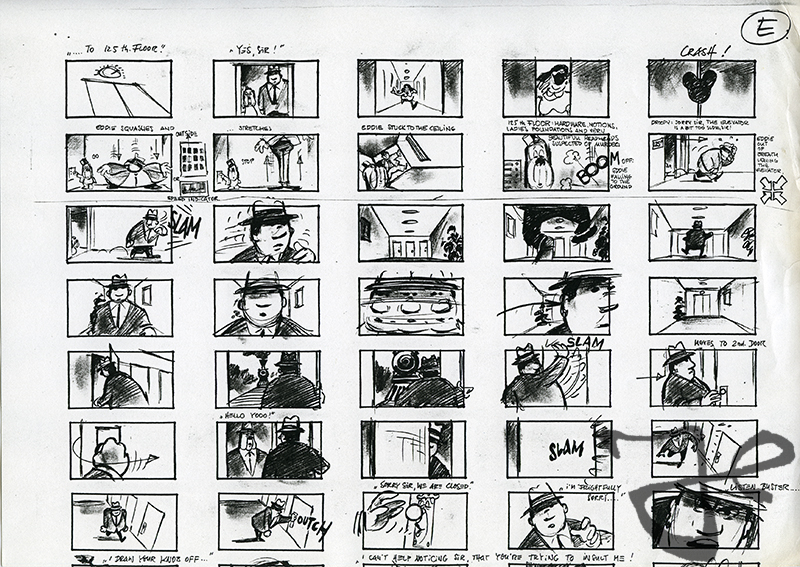 Among these seconds was also the elevator scene with Droopy. 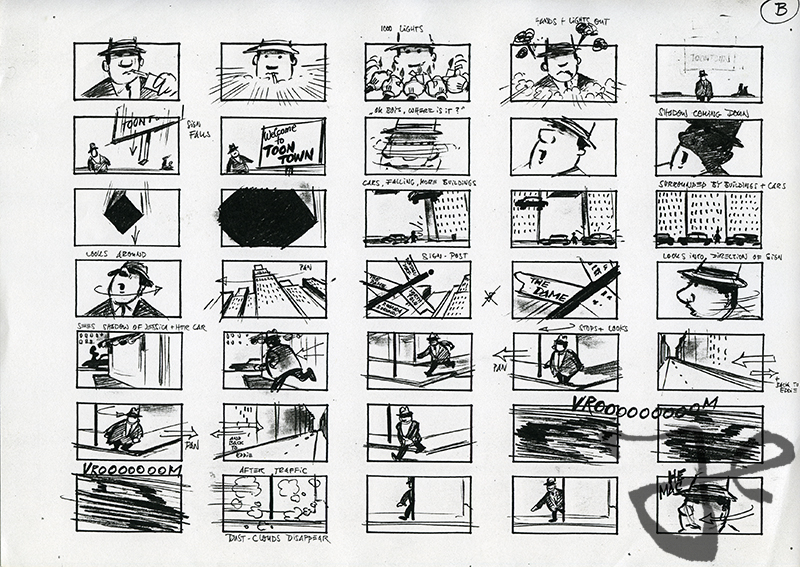 Below is a part of the storyboard by Harald Siepermann and Hans Bacher. 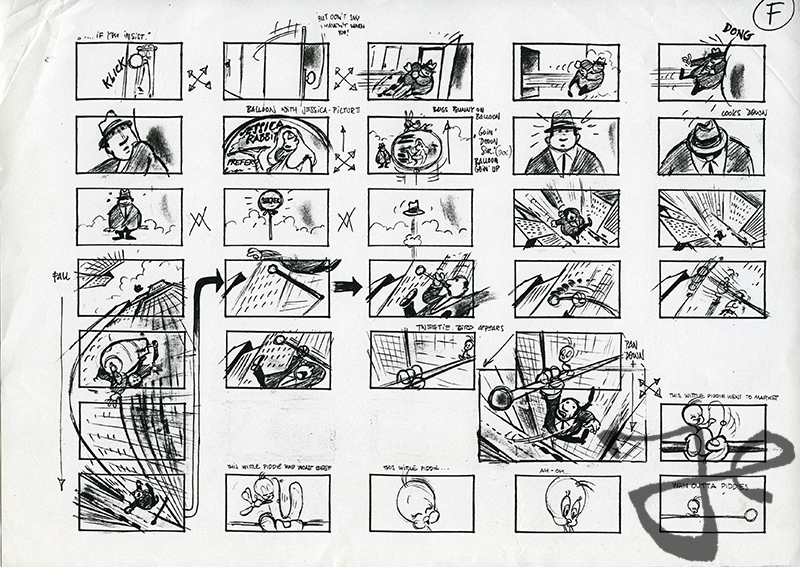 Click here for a post with more information about the Escape from Toontown storyboard from the wonderful blog of Hans Bacher. 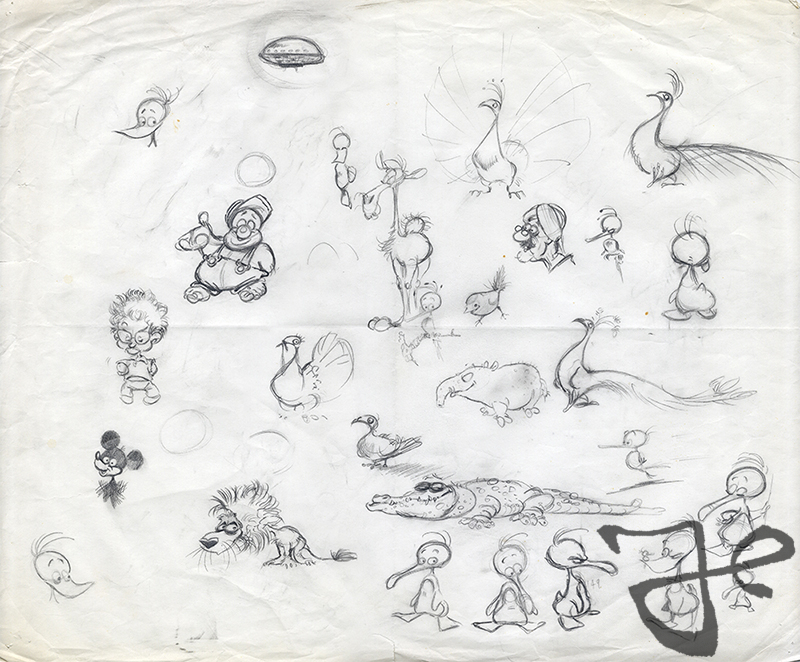 On February 18, 1987, the first comic book about the adventures of the duck Alfred J. Kwak was released. 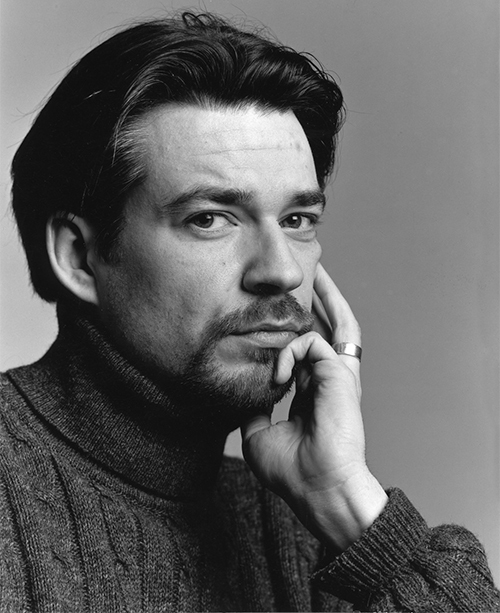 The creative trio Harald Siepermann, Hans Bacher and Herman van Veen already discussed ideas for the second issue. 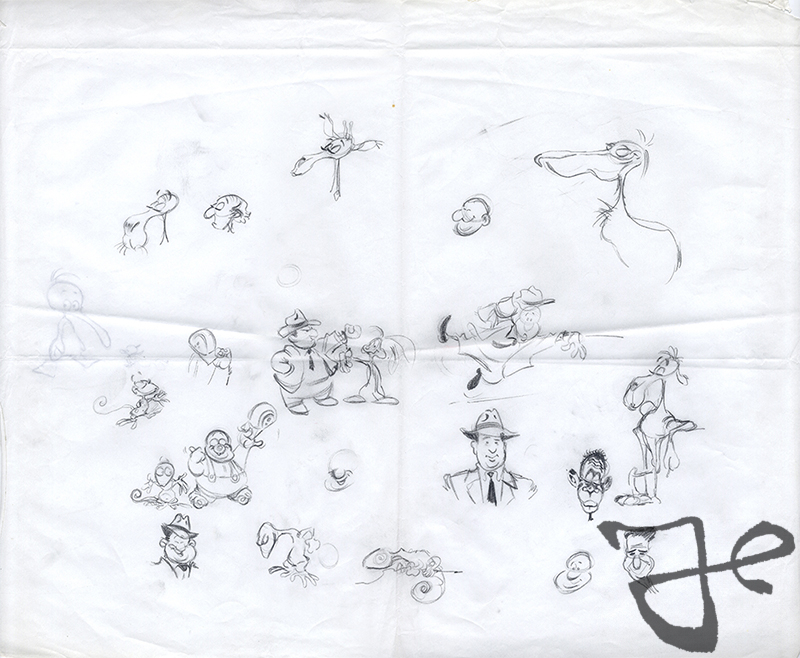 However, this had to be put on hold since Harald Siepermann and Hans Bacher were asked to work in London on character design of the weasels for the movie Who Framed Roger Rabbit. 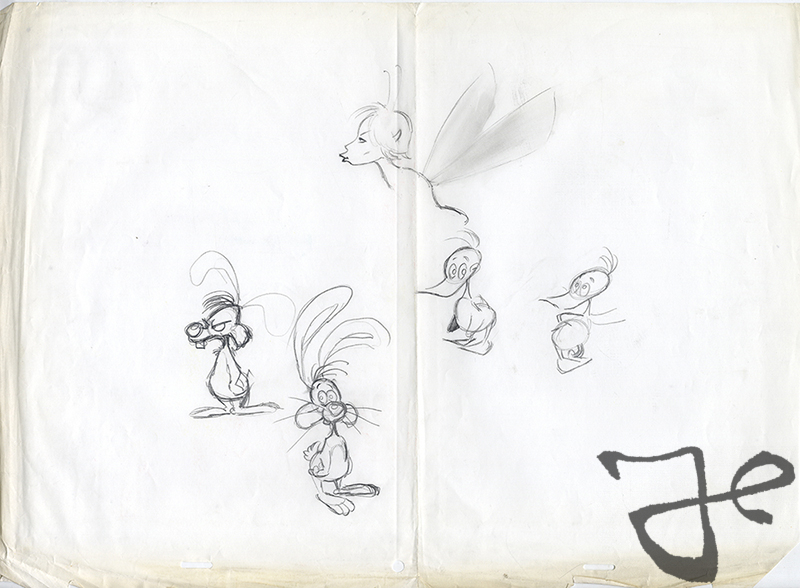 After their work on the weasels they were asked to come to Los Angeles to work on the storyboard of the “Escape from Toontown”-sequence. 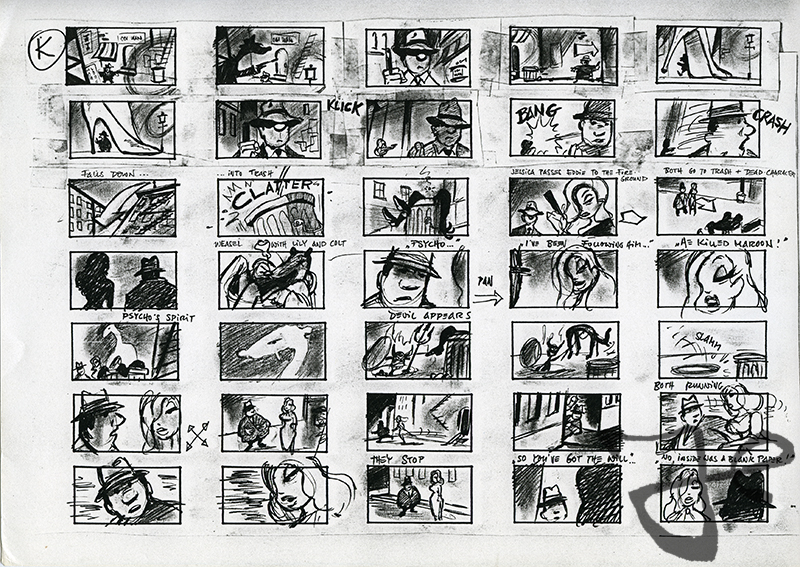 For several weeks Siepermann and Bacher worked in the Amblin studio designing the storyboard. 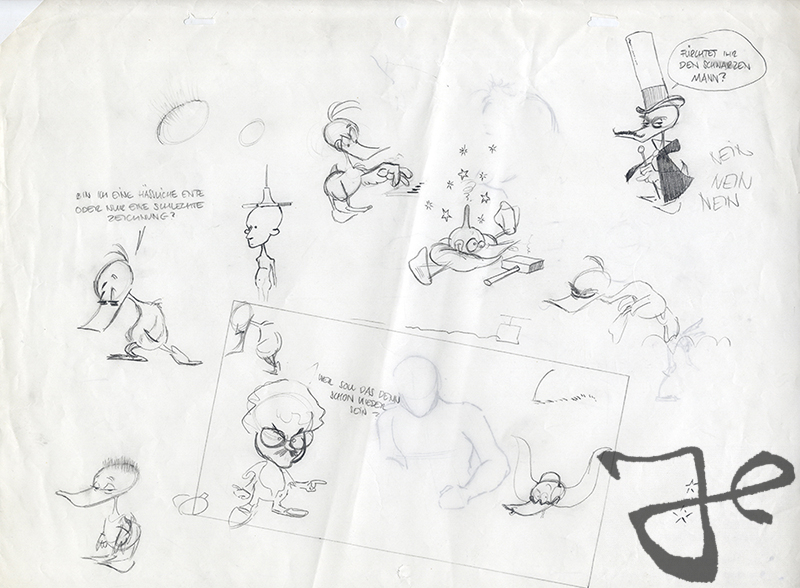 Between Harald’s work on the storyboard he often drew sketches of his creation Alfred J. Kwak in various shapes and poses. 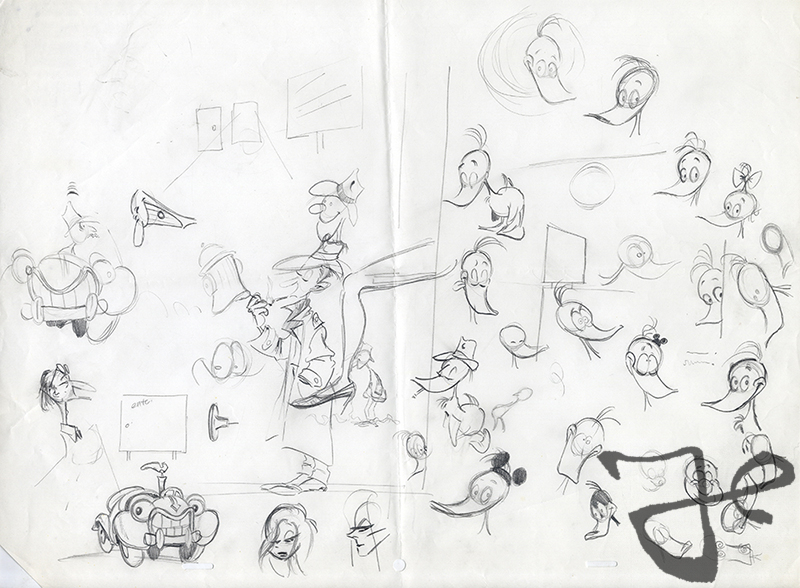 Here are some of the sketches he made while working in Los Angeles on Who Frames Roger Rabbit.